Tangl has been costuming since 1988 and has dressed shows for stage and screen as well as private collectors, charities, schools, and non-profit organizations. She is Corresponding Secretary for the International Costumer's Guild and is a founder of her local branch, the Gem State Costumers. She's done over 500 appearances nationwide to teach costuming. She's well-versed in everything from wigs to shoes to packable props, with over 90 panels to her resume. Her how-to costuming book, Surviving Your Own Creativity, released in March of 2015 and is the best selling book in the FJ Publishing catalog. 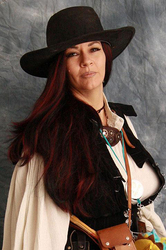 She has taught at conventions across the country including the World Science Fiction Convention and Salt Lake Comic Con. Tangl has also been published in the 2011 Hugo Award winning Drink Tank fanzine and in the 2012 Hugo Nominated Journey Planet. Her first book, Thine Enemy's Eyes, is the premiere novel released by Fantastic Journeys Publishing. As a co-founder, Tangl looks for submissions from other authors, helping them to tune their writing and realize their dreams. "The company is run by authors, for authors, and is small enough to give you individual attention. We welcome submitters and want to learn about your endeavors!" Her fifth book in her series, Full of Sound and Fury, releases in June of 2015.